This page includes several articles on the involvement of the Jewish community in the women’s suffrage movement, and a section that links to biographies of noted Jewish Suffragists. For over 100 years, WRJ has taken positions on social justice issues, from women’s suffrage and anti-lynching laws to pay equity and LGBTQ equality. The American woman suffrage movement is usually characterized as predominantly white, Protestant, Anglo-Saxon, and upper-and middle class in composition and support. Although this may be true as far as the formal organizations are concerned, the issue of woman suffrage was supported, often actively, by large segments of immigrants and the working class. This has been noted by some writers, but few detailed accounts of this support have appeared. The Jewish community played a crucial role in the suffrage victory in New York State in 1917. New York occupied a strategic position in the struggle for woman’s suffrage. Most early suffrage victories had taken place in western, rural states, and suffragists were convinced that farmers and Native Americans were their main support rather than the urban, working classes. 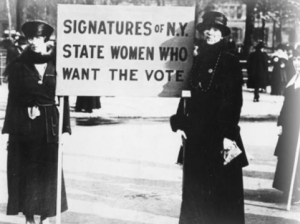 New York was the first eastern, industrial to give women the vote prior to the Constitutional amendment of 1920, and a victory in New York was considered crucial for convincing Congress to act on the federal amendment. Suffragists also believed that New York City presented almost insurmountable problems. In 1910 approximately 37% of its population was Roman Catholic and 31% Jewish. Thirteen percent were either first or second generation Irish and a similar number first or second generation Italian. By 1920 at least 78% of Manhattan was either foreign-born or had foreign-born parents. New York conducted two referenda on suffrage in 1915 and 1917. In the earlier vote, the issue was defeated by a narrow margin in both New York City and the state. In 1917, however, the amendment passed both in the city and the state as a whole, although losing in the state outside of New York City. It was the city, with its large Catholic, Jewish, immigrant, and working-class population which carried the state for woman suffrage. August 26, 2015 is the 95thanniversary of women’s suffrage – the largest expansion of democracy on any single day in our nation’s history. American Jews, deeply committed to our rights as citizens, played an active role in the suffrage fight; an important part of our history that deserves to be better known. Have you heard of Maud Nathan, daughter of a prominent NY Sephardic family? Maud Nathan was a leader in progressive Era reforms. As president of the NY Consumer League, she led efforts to improve working conditions for working women in stores and factories. As an officer in the Equal Suffrage League of New York, she spoke for suffrage in New York and around the country. Fluent in French and German, she was a featured speaker in all three languages and an officer at international suffrage conferences. “When I hear a woman talk so well in the public interest, “President Woodrow Wilson said after meeting with Maud Nathan, “it almost makes me believe in woman suffrage.” (He eventually got on board.) Former President Theodore Roosevelt was already on board in 1912 when he asked Nathan to chair the Suffrage Committee of the National Progressive Party. Thereafter, he referred to her as his “boss” on this issue-a title he conferred on very few! Rabbi Steven S. Wise of the Free Synagogue in New York brought his pro-suffrage convictions with him when he moved from Oregon in 1907, where suffrage had already been on the ballot in state referenda. A respected religious voice was particular important to suffragists, who were regularly denounced for undermining traditional values. Steven Wise was not the only Reform Rabbi to speak up for suffrage-the Central Conference of American Rabbis voted for it in 1917, but he was among the most active and the best known. The honor role of Jews who led the fight for women’s right to vote is longer than I can fit here: Carolyn Katzenstei, Pa; Jennie Loitman Barron, MA; Hanna Marks Solomon and her daughter, Selina, CA; Sara Platt Decker, CO; Gertrude Weil, NC; Felice Cohn, NV, the first female assistant attorney general in NV who wrote the state’s suffrage bill and led the lobbying to get it passed. Their names may have slipped from view, but these women and men set a powerful example. At a time when Jew’s right to be full Americans was still a question of some debate, they spoke out for the principles on which America was founded. Facing angry opposition and mean spirited ridicule, they reached across class and economic lines to make democracy stronger. Like the young Jewish volunteers of the civil rights movement who organized in support of the Voting Rights Act, another essential step in building democracy, our suffrage forbearers left us a precious heritage, as Americans and as Jews. We can honor it today by celebrating their history; remembering equality on August 26, and safeguarding everyone’s right to vote!